I'm pissed off at you sunglasses. I've been pissed at you for years. But recently, it's gone to another level. It used to be, like so many unhealthy relationships, that I was really angry at myself. Specifically, I bemoaned my inability to hold continuous ownership of a pair of sun-blocking spectacles for over 3 weeks. 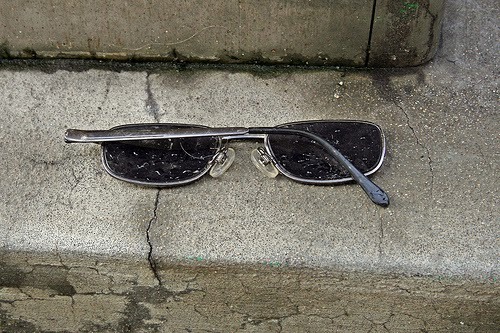 I lost them everywhere; on the subway, in the car seat, and off to places unknown. And when I wasn't losing glasses, I was breaking them. I would sit on them or casually throw them in my backpack until I found them with a lens or temple missing. I hated how disposable I made them. But I adapted. I started only buying sunglasses that cost less than 10 dollars. Every once and awhile I would splurge at get the really cool neon green shades for $12.99. I will tell you that the kid's section at CVS is a treasure trove for sunglass pearl seekers such as myself. And if the new pair didn't sit perfectly straight or rubbed my nose a bit – who cares – they'd been gone in a few weeks. And that's how things remained until about 3 years ago when we took a family trip to my parents' and cousin's alma mater: Michigan University. For whatever reason, my father had the impulse to buy me a superb pair of Michigan-themed (aka. yellow framed) sport shades. While they were a little more "frattish" than my usual fare, I am always inclined to give my parents' presents the benefit of the doubt. 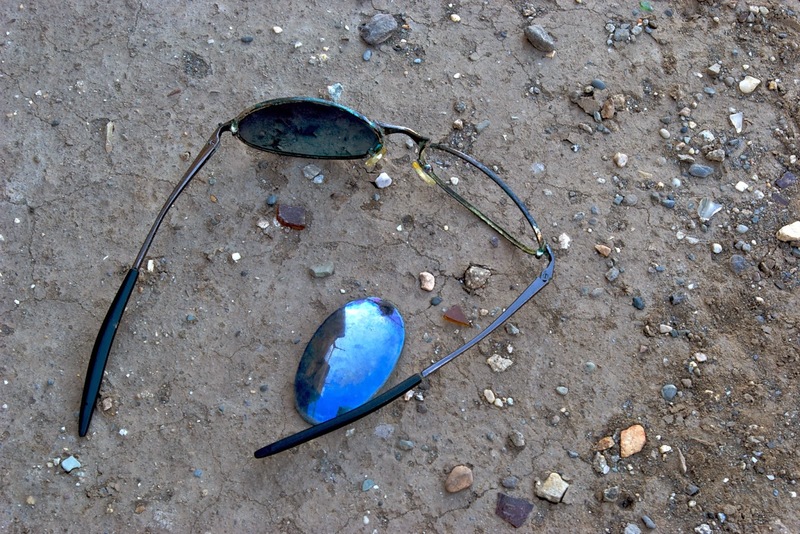 And so I set upon the Sysiphisian task of retaining a pair of sunglasses from their dawn until dusk. I kept those suckers in their case. They had a specific place in my car. And if I brought them into my house, they were put right next to my car keys. And those glasses lasted. Despite their somewhat douchey exterior (sorry dad), they were excellent glasses. At some point their quality outweighed their yellowness on my face, and I had them on pretty consistently. You'll notice that I'm using the past tense. The Michigan glasses are not, in fact, lost. I can tell you that at the time of this writing, those yellow shades rest atop the cabinet by the front door. However, they are no longer in the regular rotation. Recently one of the of temples snapped in the middle, but that particular section is encased in the flexible plastic of the ear pieces. So, the combined effect makes the glasses wearable, but wonky. One side doesn't have any grasp or cling to the face, so the front is always a bit tilted. I still wear them when driving long distances because the lenses are so sweet. But my new glasses, my regular glasses, are back to being from the CVS Originals collection; Pseudo-aviator goodness that keeps the sun out and the eyeballs in. I've been rolling strong with them for about a month now. But yesterday they got their first real test of any sort, a jostle from an unattended arm. The smack came to the left temple, and at first, I thought all crisis had been averted. Upon further inspection, however, I realized the nosepiece now felt as if it were burrowing a den inside the bridge of my nose. Turns out I was completely wrong. The nosepiece was, in fact, completely missing. Something about the sudden lateral movement caused the plastic nose-pad to spring free of its wire restraint. And this is where I get uber livid. There is no good reason why you can't find a way to fuse a nosepiece to the glasses they are built to support. The current "tightly wound wire around a plastic nub" solution is simply not the extent of our architectural technology. And I shouldn't have to add another casualty to my sunglass graveyard simply because the glasses-making industry relies upon it's products being consistently shoddy to the extent that they fuel more sales. This one is on you cheap sunglass makers. 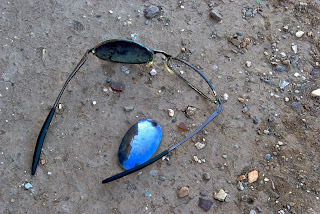 Your sunglasses are not only inexpensive, but they reflect that low cost. And I hate it. 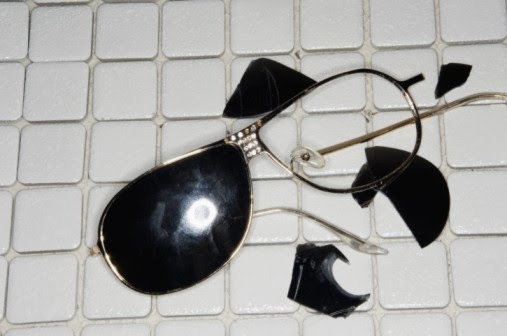 And I hate that I still don't have confidence in my ability to not lose or destroy sunglasses enough that I buy 3 pairs of these shitboxes to ever one I would need otherwise. I hate that I have a enough ex-sunglasses with one lens missing to start my own collection. But until they start implanting light correcting corneas, most of all, I hate that can't seem to find any way to stop this desperate sunglass merry-go-round.